Thumbprint cookie recipes come in many flavors and textures. They can have a smooth surface, or a coating of chopped nuts. They can be filled with jam for a bright treat, or with icing or ganache for some smooth decadence. Below is an almond thumb print cookie recipe known in France as Niçois Suns, or Soleils de Nice. It's among a few thumbprint cookies with a rich history. There are also some variations below the recipe, including chocolate thumbprint cookies. Stir 1 Tbsp of the apricot jam, and the vanilla, into 1 egg white. Mix in 2 C of the almond and sugar powder. Work in the rest of the almond powder with your hands. Turn onto a counter or board dusted with powdered sugar, and dust the top. Roll into a cylinder and cut in 4 pieces. Roll the 4 pieces into ropes about 10 inches (25 cm) long, and cut each into 10 pieces. Coat each piece with the beaten egg white, dropping several at a time onto the chopped almonds. Gather each one up and roll it into a ball. Place on parchment lined baking sheets, an inch apart, pressing your moistened finger in the center to make an indentation. Press it out to make the cookie 1 3/4 inches (4 cm) across, with 1/2 inch (12mm) thick rims. Let them sit out at room temperature for 24 hours (if you have the patience) to form a crust, which helps them hold their shape. Place the cookie sheet on top of a second cookie sheet, to protect the bottoms at this high temp. Preheat oven to 450º F (230ºC). Bake 4 to 6 minutes, until they barely begin to color. Too long and they'll lose their shape. Cool on baking sheet on wire rack, then remove from paper. Fill the cookies with 1/2 tsp (1/4cl) of jam, using a pastry bag if you like. Arrange pistachio slivers on the rims, radiating out like the rays of the sun. Make sure one end sticks in the jam so they don't fall off. Allow the jam filling to cool completely before stacking them. Keep in an airtight container for up to 3 days, if they last that long! This recipe was adapted from one of my favorite baking books, The French Cookie Book , where you can find dozens of flourless almond cookie recipes that are gluten free. Melt the jam over low heat, then push through a fine strainer with a spoon, to get out the lumps and fibrous bits. Cool before using. *Process the almonds with ½ the powdered sugar in a food processor, pausing occasionally to scrape sides and break up lumps. The sugar will help absorb the oil so you can get a fine powder, but if you process too long it will become oily and unusable. You will find there are still some pieces that are too big. Sift the powder through a medium strainer to get out any large pieces, then process those with the remaining powdered sugar. OR You may be able to use a fine blanched almond flour, like Honeyville almond flour, and mix it with the powdered sugar, although I haven't tried this. Leave off the pistachios for a classic look. Use any kind of jam you like, or icing. Fill centers with your favorite chocolate, melted, and allow to cool. 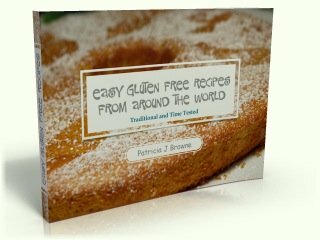 Interested in some free, and easy, gluten free recipes? Download this eBook when you sign up for my FREE monthly ezine.